LaTeX is a markup language developed by Leslie Lamport and used for professional-quality typesetting. It is based on TeX, which was first released in 1978 by the mathematician Donald Knuth, and improved by the contributions of many people over the following decades. It excels at accurate and efficient typesetting for mathematical formulae and special characters. LaTeX itself is a higher level language designed to make it easier to use the TeX typesetting program; that is why this document refers to the LaTeX language but to TeX (.tex) files. Typesetting software turns a text file into a finished document. A typesetting markup language is a language used to annotate documents in order to specify the desired formatting. Unlike a conventional word processor, which automates much document formatting, LaTeX gives you complete control over every aspect of the document. This comes at the cost of requiring you to specify the desired format in detail, but with some familiarity LaTeX can be easy and efficient to use. A LaTeX installation includes (at minimum) a text editor and a compiler. It may also include supplementary programs like BibTeX, which works with LaTeX to create properly formatted bibliographies. To edit TeX files, you can use a standard text editor, or an editor built specifically for LaTeX, like those included in the LaTeX distributions linked below. 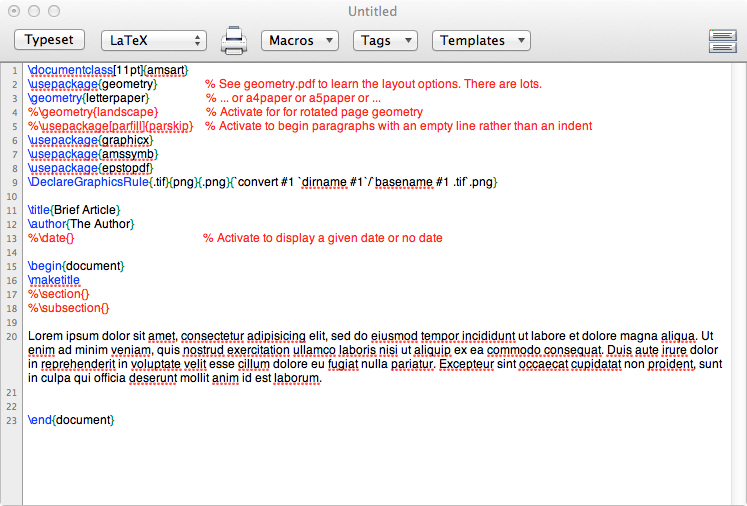 Using a purpose-built LaTeX editor simplifies document editing by providing document templates and built-in commands. The compiler takes the TeX file and carries out its instructions to produce a finished (typeset) document that can be printed or saved as a PDF. TeX files are portable between different compilers, and will provide identical outputs no matter which platform they are used on. This consistency and portability is one of the strengths of LaTeX for formatting documents. If you use LaTeX, you don't have to worry about how your document will show up when it's loaded on someone else's computer, or in a different operating system. This makes it ideal for submitting documents for classes or for publication. For more information, please see the page Getting Started with TeX, LaTeX, and Friends from the TeX Users Group, or see the suggested references below. It can be difficult to learn material from a video tutorial. For best results in learning the syntax of a particular command or process, please try to work along with the tutorial and rewatch the relevant section. You can also pause the tutorials to have more time to read the LaTeX file and comments. There are also a number of print and video references available online. Please refer to the references section for more information. When you use a word processor, you usually see the formatting of the finished document as you type. When you use a markup language like LaTeX to create your document, you will see all of your text in the same font, without formatting. 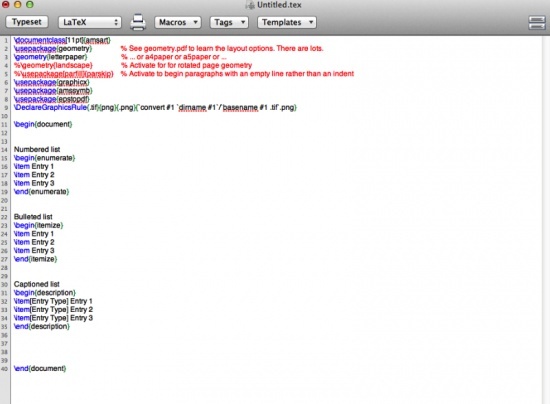 You use different commands to specify the formatting you want in the finished document. This process gives you far more control over the final appearance, which can be essential when working with mathematical formulae and special characters. This tutorial introduces viewers to the LaTeX markup language, including text formatting commands, math formatting commands, and environments. 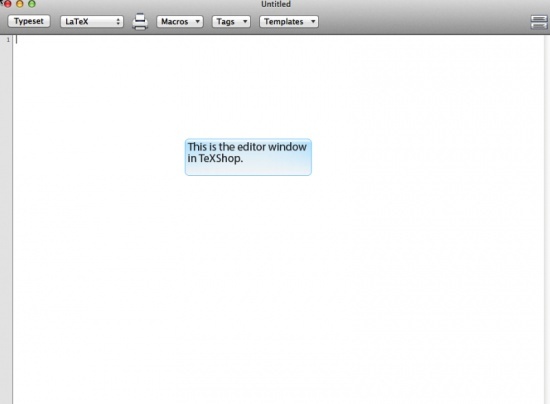 It describes the process of creating a TeX file and generating a finished document in TeXShop. As discussed in the previous tutorial, commands in LaTeX fall into one of several categories. Math commands allow you to display and format mathematical formulae and characters. Text commands allow you to format text. Lastly, environments allow you to change the formatting of your document. Since commands in LaTeX work the same way, using an unfamiliar command is largely a process of finding the appropriate language and syntax. LaTeX can also be modified through the addition of a number of packages that permit new or enhanced document formatting capabilities. The use of these packages is beyond the scope of these tutorials, but if you are interested, please refer to The LaTeX Companion listed in the suggested references. This tutorial presents some additional LaTeX commands and highlights some resources for finding mathematical or text symbols, such as Detexify. It also discusses the main resources for finding help, including print and online sources. LaTeX is not just for formatting mathematics! You can also create bibliographies. This is done with the accessory program BibTeX. BibTeX integrates with LaTeX to format bibliographies and in-text citations in a range of citation styles. This integration makes it easy to create documents with LaTeX and edit them from start to finish. 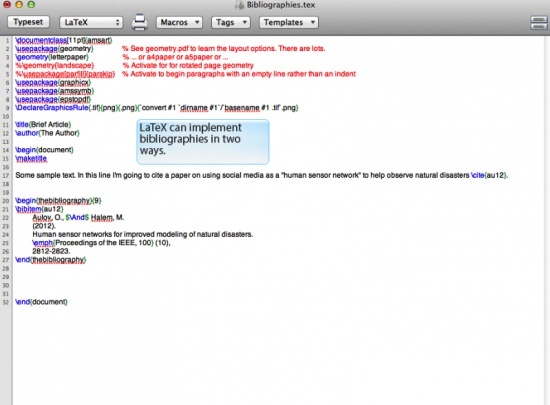 This tutorial discusses the key aspects of generating bibliographies with LaTeX. It includes the necessary commands for creating and formatting bibliographies and discusses several ways to implement them in LaTeX. It demonstrates how to export references from an article database in LaTeX format. It also discusses the program BibDesk for Mac OS. Grätzer, G. (2007). More Math Into LaTeX (4th ed.). New York, NY: Springer. Mittelbach, F., Goossens, M., Braams, J., Carlisle, D., & Rowley, C. (2004). The LaTeX Companion (2nd ed.). Boston: Addison-Wesley. Goossens, M., Rahtz, S., & Mittelbach, F. (1997). The LaTeX Graphics Companion. Reading, Ma. : Addison-Wesley.